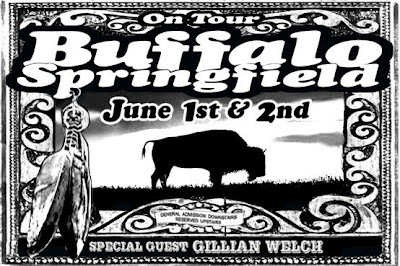 Neil Young News: Buffalo Springfield Tour Countdown... "Hello I've Returned"
Buffalo Springfield Tour Countdown... "Hello I've Returned"
The Buffalo Springfield Reunion Concert Tour kicks off tomorrow night at the Fox Theater, Oakland, California. So here's vintage Buffalo Springfield and Stephen Stills' "Hello I've Returned". Check out the YouTube Mix of ‪Buffalo Springfield videos‬‏. Lotsa classic stuff. Also, see Buffalo Springfield Reunion Concert Tour Reviews. For more, see The Triumphant Reunion of The Buffalo Springfield, Pearl Jam and Neil Young @ 2010 Bridge School Benefit Concerts. Just curious as to if there's a full tour here ? All I see now is 6 dates and then nothing for a few months.I thought this would be an ongoign tour with many dates ? I am very curious. These are full shows aimed at a Buffalo Springfield aduience rather than the short sets they did for the Bridge audience. How adventurous will these setlists be? Will they do Box Set tracks like Hello I've Returned? Will they have new songs? There is so much stuff that hasn't been aired in so long. Expecting to Fly. Four Days Gone. Uno Mundo. Down to the Wire. Leave as a guitar workout. Out of My Mind. Special Care. Pretty Girl Why. The mind reels at the possible set list. And I can't be there. And they will go electric this time! @12:27 - doh. you are so right! we'll get our proofreading staff right on it. thanks! Sorry to be pedantic Thrasher but surely it`s `everbody look what`s going down`. You need new proofreaders! Joking aside, you`re doing an amazing job getting all this together, as always. Total respect. Dave Grohl and Neil Young: 'Sign of Love"